This super quick and easy recipe was inspired by one of my favorite food app, Filibaba Smoothies, which proposes a very similar way to incorporate green tea in your diet, and I found it so clever that being that I always keep some green tea at home, I immediately decided to try to customize it and make something I would really enjoy. And to stay on track with the all antiox theme, I threw in a good mix of ingredients which all have antiox proprerties. First things first, I sliced the banana into pieces and put it in the freezer for one or two hours before starting preparing my smoothie so that the banana will be cold and almost frozen and will make your smoothie super resfreshing. Then I prepared 1/2 cup of green tea and let it cool for half an hour to avoid my smoothie to come out too warm, and finally I peeled my apple and cutted into pieces. Now it’s time to start blending and mixing and using a blender I firstly blended together the banana and lemon juice, then added the apple and lastly the green tea. I blended it very well for a few minutes as I didn’t want any big fruit pieces going on in there and then served it into a cute jam jar with two colored straws. I’m not even a big fan of banana smoothies usually but this is seriously delicious, creamy, refreshing and amazing and I keep drinking and preparing it everyday since when I discovered it. This doesn’t taste like green tea at all, and if you have a big blender I would suggest to prepare a good dose of it and serve it for breakfast to your family or store in the fridge and drink it within one or two days whenever you desire. You can also add a bit of sugar to your taste if you want, but I generally go without it as there’s still the sweetness of an entire apple in there. 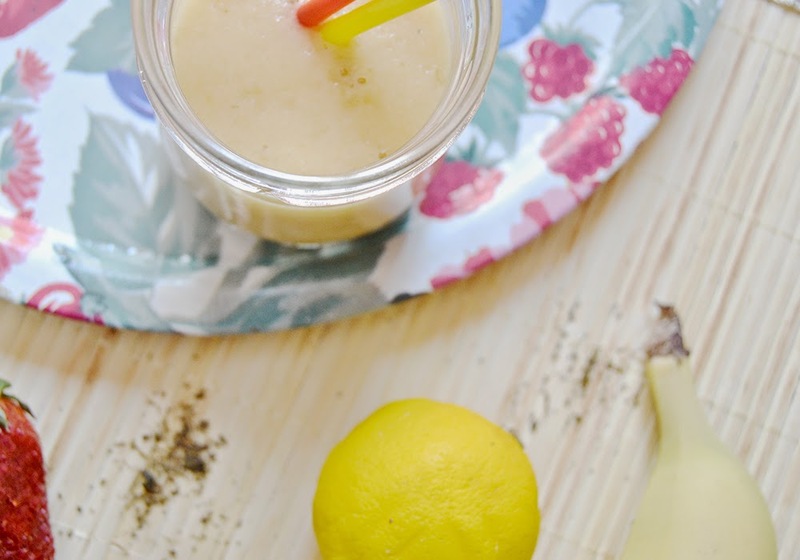 Hopefully you will enjoy this delicious but healthy smoothie too! Will you try this recipe? Which is your favorite smoothie flavor? I’m sure it’s very tasty, except for healthy! Maybe add some strawberries too? I’ll give it a go! I would appreciate it if you could visit my blog for my first post! Ma sai che non avevo mai pensato di utilizzare il tè negli smoothie?? Io di solito vado di semplice accostamento banana-fragole, con latte d’avena o yogurt (o semplice o alla banana), perché la banana è uno dei frutti che preferisco. I miei prossimi esperimenti prevedono di provare lo yogurt greco, e con l’arrivo della frutta estiva di sperimentare nuovi accostamenti, ad esempio con pesche e mango. Avevo in mente anche io di fare un post simile! I’ve been making tons of smoothies lately! Mostly using our local huckleberries that we picked and froze last year. This one sounds so simple and healthy! Thanks for sharing! PS found you via a twitter chat!